Fragrant. Soothing. Simple to Use. Effective. Quality paraffin wax!. Value Oriented. Budget Buyer. Quality Oriented. I have arthritis in my wrists and hands and the pain is intense at times. My paraffin dip is the only way I can relieve the pain and the added benefit of soft, moist skin is terrific! Soothing. Simple to Use. Effective. Fragrant. Use in the Parafin Wax Bath for my arthritis. Makes them feel warm and soft. Ease Pain. Daily Use. Chronic Pain. Much better than the paraffin you can buy at chain stores. I've purchased several different brands in the past and like this one the best. This is professional grade and works better. Especially when used with the Therabath Pro. I did not get six, only one. Effective. Soothing. Fragrant. Simple to Use. This is a great product, however the item description said I would receive six one lb. paraffin's. I only got one. by jut's from Dandury, Wi. How many "individual bags" are there in the 1 lb. box? 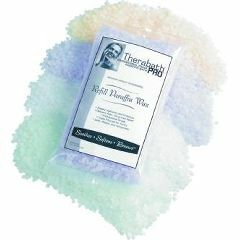 How many pounds of paraffin wax do I need to fill my spa bath??? Is there a perfume added? I don't want anything that smells.